Paying your bill is quick, easy and only a click away! Good news! We store RV’s, boats and trailers. Here at Elite RV & Car Care we take brake maintenance safety very serious. Many of us have very busy schedules and put a lot of mileage on our vehicles. Maintaining the brake system is a critical safety component to ensuring safe travels. We rely on our brakes for everything from commuting to running a quick errand to the grocery store. The vast majority of the vehicles on the road today have complex braking systems. This system uses a hydraulic fluid system to engage your brake to stop or slow down the vehicle. How this works is, when we push on our brake peddle that pressure transfers through the brake fluid hydraulic system and then transfers to a brake pad that is pressed against the rotor thus slowing the rotations of the tire. There are basic to performance options when discussing these parts. Below we will outline some of the options and considerations. A good recommendation is to have your brake system inspected every six months depending on the amount of driving and mileage you travel. 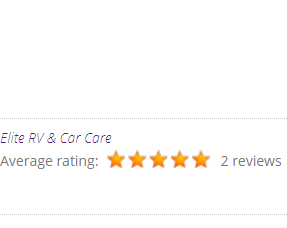 Elite RV & Car Care uses quality parts for the vast majority of vehicles on the road today. From performance parts such as ceramic brake pads, to slotted over sized rotors to factory original equipment replacement, we can handle your needs. Many of the sports cars on the road today have very impressive power and torque with a stock braking system. This is why the aftermarket brake upgrades have become very popular. There has also been a large increase of lifted trucks with over sized tires on the road. A stock brake system was not designed for over sized off road tires. 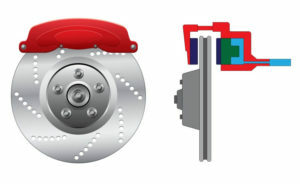 Modern brakes have built in warning devices that are metal tabs designed to make a warning noise once they are ready for replacement. The brake pad over time wears down to these metal indicators. If left for too long once worn, these metal tabs can create grooves in your rotors which significantly increases the cost of brake replacement. In order to maintain safety as well as keep costs down, it is best to have your brakes inspected every 3 oil changes or every 10,000 miles to make sure your are doing everything you can to maintain the system. We offer a full range of garage services to vehicle owners in Humble, Atascocita, and Kingwood including brake inspections, service and repairs. We can help you with everything from a brake pad replacement to a master cylinder fluid exchange. For more information regarding our brake services, contact our customer service desk. When you press down on the brake pedal, you activate the brake cylinder that delivers brake fluid to the calipers which squeeze your rotor and cause your car to slow down. How often should I service my brakes? A good recommendation is to have your brake system inspected every six months depending on the amount of driving and mileage you travel. DOT 3 is the most common, however, use the type of brake fluid specified in your owner’s manual. Following your manufacturers recommendation is always best practice when it comes to brake service and repair. What's included in a brake inspection? Brake Inspection includes checking your brake pads (and/or shoes), calipers, rotors (and/or drums), wheel cylinders, hardware (springs and adjusters), hoses, parking brake cables, fluid condition, wheel bearings and grease seals, master cylinder fluid exchange.